RS-60E3 Multi-Function Remote Shutter Release Cord. Compatible for Canon 500D 550D 70D 80D 60D 500D 600D 650D 750D 760D 700D 1200D 650D 1200D 1300D 100D 450D 350D G12 etc. Canon EOS Digital Rebel T4i / 650D. Canon EOS Digital Rebel T2i / 550D. Canon EOS Digital Rebel XSi / 450D. Canon EOS Digital Rebel XTi / 400D. Canon EOS Digital Rebel T1i / 500D. Canon EOS Digital Rebel T3i / 600D. You can also lock the button for long-exposure photographs. 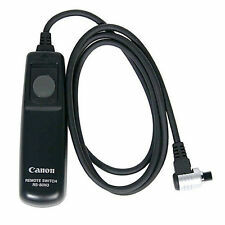 1 x Canon RS-60E3 Remote switch with 60 cm / 2 feet cable. No buy it now price. Nearly New Canon RS 80N3 Camera Trigger Remote Switch In Original Packaging. Condition is Used. Dispatched with Royal Mail 2nd Class. Genuine Canon Eos Camera trigger. Used once. Bought for my Canon 5DMk III. Comes in original packaging with instructions. Please see my other listings for more bargain camera equipment! Suitable for: EOS-1D X，1Ds Mark III，1Ds Mark II，1Ds，1D Mark IV，EOS-1D Mark III，EOS-1D Mark II N，EOS-1D Mark II，EOS-1D，EOS D2000，EOS 5D Mark II，EOS 5D Mark III，EOS 6D，EOS 5D，EOS 7D，60Da，EOS 50D，EOS 40D，EOS 30D，EOS 20D，EOS 10D，EOS D60/30，EOS-1v HS，EOS-1v，EOS-3. The RC-6 can be used in "bulb" mode which is ideal if you like to capture long exposures. Here is a canon eos rs-60e3 remote switch. Suitable for: 5 dii / 1000 d, 450 d, 400 d, 350 d, 300 dpro1 G7G6 G5 G3 G2 G1 S1is S70S60 Pro90IS 300 v300x 3000 VQD IXUS jr/Ⅱ/Ⅲ Canon models. CR2025 Button Cell Battery. Canon RC-6 Wireless Remote Control for EOS Cameras 70D 5D T3i 500D 550D 600D etc. Condition is Used. Dispatched with Royal Mail 2nd Class. 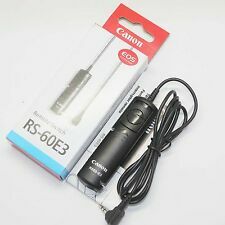 Canon RS60 E3 remote cable shutter release - like new. Suitable for: EOS-1D X， 1Ds Mark III， 1Ds Mark II， 1Ds， 1D Mark IV， EOS-1D Mark III， EOS-1D Mark II N， EOS-1D Mark II，EOS-1D，EOS D2000，EOS 5D Mark II，EOS 5D Mark III，EOS 6D，EOS 5D， EOS 7D，60Da， EOS 50D，EOS 40D，EOS 30D，EOS 20D，EOS 10D，EOS D60/30，EOS-1v HS，EOS-1v，EOS-3. Canon EOS Digital Rebel T4i / 650D. RC-6 remote will NOT Operate EOS 1D, EOS 5D, EOS 10D, EOS 20D, EOS 30D, EOS 40D, EOS 50D, EOS 1100D, EOS 1200D, EOS 1300D. Canon EOS Digital Rebel T2i / 550D. Canon EOS Digital Rebel XSi / 450D. Works with Camranger App etc. Great piece of kit, used but well looked after, fully functional. With carry case which is as new. Boxed with instructions. Canon EOS 5D Mark II, 5D Mark III, 5D Mark IV, 5DS, 5DS R, 6D, 6D Mark II, 7D, 7D Mark II, 60D, 60Da, 70D, 77D, 80D, 100D, 200D, 300D, 350D, 400D, 450D, 500D, 550D, 600D, 650D, 700D, 750D, 760D, and 800D. Genuine Canon Remote Switch 60 T3 Cable Shutter Release Remote Control . Condition is Used. Dispatched with Royal Mail 1st Class Large Letter. Canon 60 T3 Remote Switch, T50 T70 T80 T90, EOS-1 EOS 5 (fits EOS 600 series with extra GR20 grip) This is an original Canon Remote Switch 60 T3 (electronic cable release) for the original Canon EOS-1, EOS 1N, EOS 1N RS, EOS 5, EOS A2 and A2E, plus the Canon/Kodak EOS DCS 1 and DCS 2 digital SLRs. It also fits the EOS 600-series cameras (the 600, 620, 630 and 650) and the EOS RT but ONLY if you have the GR20 (GR-20) grip with remote socket on the side (not included). Genuine Canon Remote Switch 60 T3, cabled shutter release, in excellent used condition. Works with EOS 30/50/50E/300/300X/300D/500/500N/3000/5000/IX/IX7 & EOS 300D/EOS 350D. The first main photo will show everything that is included in the sale and what you can expect. The first main photograph will show all contents of sale, if is it not shown in the photos then it will not be included in the sale. Remote Shutter Release. Our friendly staff will also assist you to ensure your buying process easy and smooth! EOS-3, 1v HS/1v, 1D-series, 1Ds-series, 5D-series, 6D-series 7D, D30, D60, 10D, 20D, 30D, 40D and 50D. Wireless movie shooting. We will always help you to have a 100% positive happy buying experience. Easy to set up and use. Lockable shutter release cable 50 (50cm long) for the Canon F-1n. This is a genuine Canon infrared remote control unit, originally designed for some of the company's film SLR and compact cameras. It also works on several newer EOS and compact digital models with an infrared remote control receiver built in (please check your instruction manual to confirm compatibility). A remote control reduces vibrations and camera shake, especially when taking macro or close up shots, and allows you to easily take pictures of yourself, family groups, etc. This one's in good used condition, fully working order and supplied with instructions (copy) and battery. Please read the full description for more important information. Canon EOS 1Ds MKI/II/III, 1D MKI/II/III/IV, 7D, 5D MKI/II/III, 10D, 20D, 30D, 40D, 50D. Excellent condition. Very light use. For Use With. 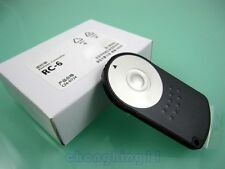 RS-60E3 Remote Switch Shutter Release Cord Control for Canon Camera EOS. Condition is New. Dispatched with Royal Mail 2nd Class. Twin cable releases are ideal for working with bellows and MACRO work. Canon Twin Cable release. The cable releases are in good working order. Remote Shutter Release. Our friendly staff will also assist you to ensure your buying process easy and smooth! Canon Remote Switch RS-60E3. Condition is Used. Dispatched with Royal Mail 2nd Class. No one knows more about them than US. For use with. For use with the EOS 5D, EOS 5D Mark II, EOS 5D Mark III, EOS 7D, EOS 60D, EOS 300D, EOS 350D, EOS 400D, EOS 450D, EOS 500D, EOS 550D, EOS 600D, EOS 650D. The RC-6 will operate in either 2-second delay mode or will instantly take a shot. • Allows for shutter release up to 16' (4.8 m). The RC-6 will operate in either 2-second delay mode or will instantly take a shot. The RC-6 is only 2.5" (63.5 mm) tall and can fit easily into your pocket or on a keychain. Specialising in photographic lens filters. REMOTE SWITCH RS-C/N - Jainisi - Compatible Canon RS-60E3 - FREE POSTAGE in UK! Jianisi Remote Switch for Canon RS-CA (RS-60E3). New, never used, but box very slightly worn at the corners.